I hope that I 5 will allow my to strike first pretty much every time, plus AC 6 and the wolf claw will hopefully give a chance to place at least a couple of wounds every turn. 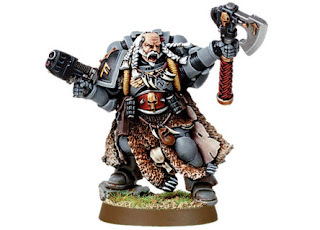 Combined with the saga of the warrior born will probably make the wolf lord a mean troop killer. The wolf lord will join 4 terminator buddies in a drop pod and will bring havoc to the enemy. His main objective will be cast jaws on low initiative troop or slow down enemies using Fury of the Wold Spirits, he will ride a drop pod with 9 gray hunters so their firepower should be enough to cripple a dangerous enemy unit before the rest of the army land. That's all for HQ, let's see if they works! edit: It turned out that the wolf lord and his terminator bodyguard were the men of the game, they get rid of 5 chaos terminator and 1 squad of plague marines while the Rune priest got killed in second turn after he shocked a predator.